Lake Oswego's Sam Haney really must have loved being a senior at LOHS. What's the evidence, you ask? How about this — he couldn't seem to let it end. Haney, a football and baseball star at Lake Oswego who graduated more than two weeks ago, stretched his Laker athletic career as far as it would go, first playing in the Les Schwab Bowl on June 16, then participating in the Oregon All-Star Series in Corvallis on Saturday and Sunday. "It was cool to be able to play in both," Haney said of the Schwab Bowl and the all-star series. "It was fun to be able to finish my career that way in both." Haney was one of just two players — along with Crescent Valley's Briley Knight — to play in both all-star contests. 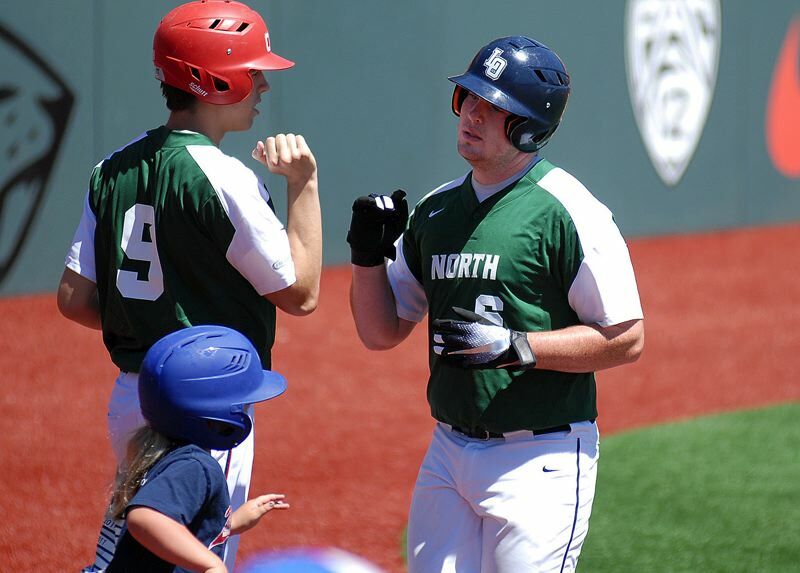 After helping the North team win the Les Schwab Bowl — Oregon's annual high school football all-star game for graduated seniors — by a 24-7 margin, Haney stepped up again in the baseball series at Goss Stadium on the Oregon State University campus. He went 2 for 4 at the plate, scored twice and knocked in one run in two games — both wins — to help the North post a 2-1 edge, secure the Series championship and reverse the South's victory from 2017. "Playing with the best players from both teams was great, plus I just love the competition," Haney said. While Haney admitted to some nerves before the start of the Les Schwab Bowl, he said he was nothing but ready for the Oregon All-Star Series. "The difference between the two was because I'm not playing football for college. I wasn't really confident," he said, adding that for the baseball series, "I felt like that was my platform. I totally felt confident." He proved it right from the get-go in the series, entering the first game in the fifth inning of the nine-inning contest and going 2 for 2 at the plate. First, he singled in the bottom of the fifth, and later, he singled home a run in the bottom of the seventh to lift his team to a 10-7 victory. Haney then started the second game of the series — the first of two seven-inning contests on Sunday — and while he went 0 for 2 at bat, he was hit by pitches twice and scored twice to help fuel the North's 11-6 win. Although Haney didn't play in the series' third game — each player in the series split time in Saturday's nine-inning game, then played start to finish in one of Sunday's two seven-inning games — the game-two victory secured the series win for the North. "Probably just beating the South was the best part (of the series)," Haney said. "That and just meeting all the people. I just like playing good competition." For his last appearance as a high school athlete — Haney heads to Ottawa University in Arizona to play baseball in the fall — he was happy with the experience. "(Baseball) is always the sport I saw myself playing in college and the sport I always succeeded in," Haney said. Beyond just the chance to compete against the state's best one more time, the all-star series also served to help Haney improve and prepare for the greater competition that lies ahead in college. "When you play against better pitching, you learn a lot more than against regular high school pitchers where sometimes you can be sloppy and still get away with it," Haney said. "I like playing against better players because it makes be honest with myself." Over the summer, Haney said he will spend his time training, increasing his strength and working with a position coach who will help him prepare to play first base in college.